Over 600 chemicals used in the various fracking recipes around the country. Fracking Chemical Cocktail is injected underground along with water and sand to blast tiny cracks in subsurface rocks in order to release oil or gas that has been trapped for millions of years. There are over 600 chemicals used in the various fracking recipes used around the country. These are not just any chemicals. Many of these are known to be chemicals that humans should not have contact with or ingest in their food or water. These are known carcinogens, or reproductive toxicants, or are very toxic to the environment. Luckily, the government requires little if any information on her numerous rendezvous. The US EPA does not require fracking to be permitted, nor does it require the disclosure of the secret recipe for Fracking Chemical Cocktail, does not require any notice of fracking to be given to landowners, does not require fracking waste fluid to be handled in an environmentally sound manner and in fact requires almost nothing about fracking to be disclosed at all! That’s a lot of unknowns. Fracking’s mysterious ways are making headlines allover the country! Her breakout role in 2011’s Gasland was unforgettable. I’m sure you’ve seen the clip of the guy lighting his tap water on fire, right? That was all thanks to our girl, Fracking Chemical Cocktail and agent-to-the-toxic-stars, Halliburton. This is the hottest technology in the oil and gas industry as industry giants such as Chevron, Venoco, Occidental, ExxonMobil, and Shell try to extract every last drop of oil or molecule of natural gas out of geologic formations previously thought to be unreachable. But states like California makes it easy on them, as you don’t need a permit to frack, nor do you have to report the chemical you plan to use or did use. Like an evil bartender, these companies hide many of the cocktail recipes behind the cloak of secrecy afforded by trade secret laws, no one except oil companies can tell you what was injected through your groundwater supply or near your favorite river or lake. The public doesn’t know which chemicals were used, how much was used, or what happened to them over time. Under current law and regulations, the only way we would find out anything about the Fracking Chemical Cocktail is if a catastrophic spill where other state laws could be applied. 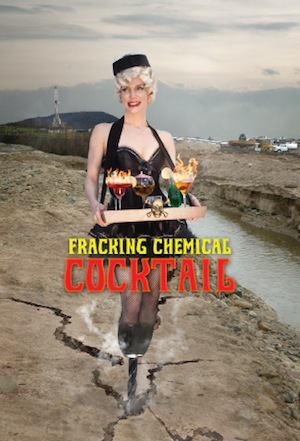 Some of the chemicals used in the Fracking Chemical Cocktail have been featured as Toxies before. Such as formaldehyde, toluene and phthalates! The oil companies needs supporting actors to get their oil and gas out of the ground. They use what are known as “service providers” to do their dirty work. These are some of those companies that produce our toxie, Fracking Chemical Cocktail — Halliburton, Baker-Hughes, and Schlumberger.